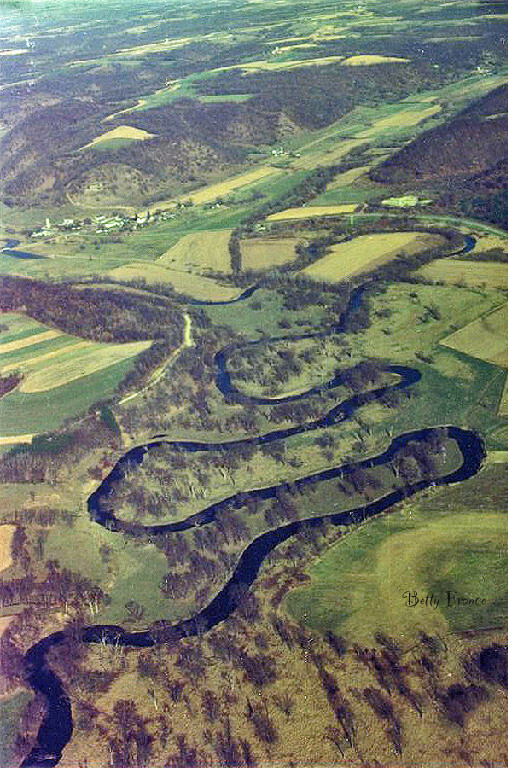 The Kickapoo River is a 126-mile-long tributary of the Wisconsin River, but because of the extremely crooked path of the river, its source north of Wilton is just 60 miles from its mouth at Wauzeka. It is named for the Kickapoo Indians who occupied Wisconsin before the influx of white settlers in the early 19th century. Kickapoo is an Algonquian word meaning “one who goes here, then there”, a fitting name as the river is very crooked, frequently doubling back on itself as it flows through the Wisconsin landscape. ​The Kickapoo River most recently flooded over its banks in Gays Mills in 2007 and again from the June 2008 Midwest floods. In 2010, the Village of Gays Mills began a planned relocation of the village. Text above courtesy of Wikipedia and is used under a Creative Commons Attribution-ShareAlike License. For more information, visit the Kickapoo River Wikipedia webpage. Visit our Outdoor Recreation webpage to learn more about activities on and around the Kickapoo River.